I know, I know, it's that day isn't it. And I had intended to write a piece about St Dwynwen, Wales's very own Saint of Love who ended up living as a hermit on her own island just west of Anglesey. Her feast day isn't Valentine's but Candlemas, two weeks or so ago. I was going to write about her life as put upon virgin who is unlucky in love and grows up to be nun (romantic? nuh-uh), but that led me to one of my all time favourite books - The Penguin Dictionary of Saints. This book is a cracker, even though I'm not a Catholic. 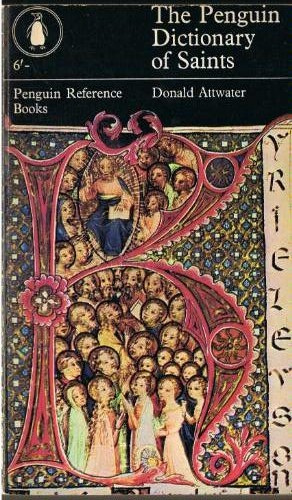 I think my copy was bought by my brother in a jumble sale in the mid seventies and I stole it off him. I have been entranced by St Agatha with her breasts on a dish (patron saint of bell founders - they're the same shape) or Saint Bathild, carried off by pirates as a child and sold into the household of Clovis II, who married her. Saint Budoc - the book lists him as a 'fantastic composition' whose mother, Azenor, was thrown into the sea off Brest in a cask where she gave birth to little Budoc. Five months later, still in this cask, the pair wash up on the coast of Ireland alive and well. 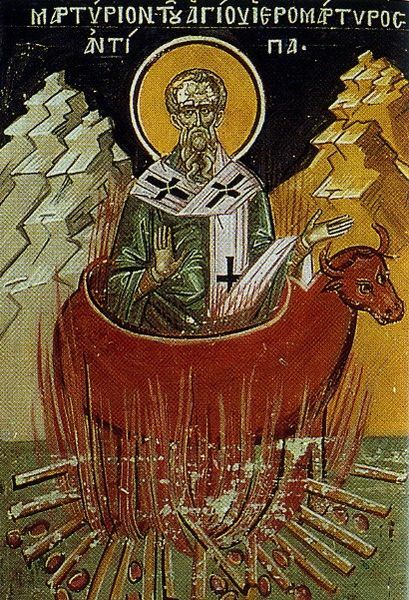 Or Saint Pelagia of Tarsus, roasted to death inside a brazen bull, which as I'm sure you're all aware was a bronze bull shaped torture and execution device which transformed the screams of the torturee into the 'sounds of a bellowing, infuriated bull. 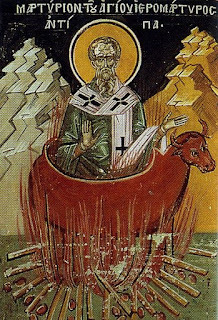 Apart from poor St Pelagia, Saint, Eustace and Saint Antipas (pictured) suffered the same fate. also suffered the same fate. There are more. Who knew how many ways there were to live and die and get canonised? The book is full of lovely snippets of the fantastical alongside the rather dull and well worth a look. It's worth it just for the names. Anyway, like I said I wasn't going to write about saints. But Dwynwen and Valentine did get me thinking about love, and not just the romantic kind. One of my theories is that's what we all write about when we make up stories. Having just finished edits on two very different books, one an 18th century romp with danger and death and dis-interring, the other a 19th century story of self deception and despair and romantic love, they are both about relationships. About need, truth, dependance, desire, the million and one ways people fit together, manipulate and deceive, get hurt or get bored.Some things remain the same whatever century we're writing in. 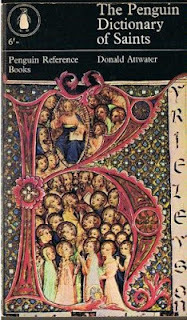 I am mad about saints' stories. I loved MILLIONS by Frank Cottrell Boyce for that reason. This is an ace post.